Nostalgic Boston memories of a simpler time including favorite restaurants no longer there, retro family road trips, travel attractions, TV and radio personalities and special hometown reflections. Also featuring old school Boston businesses still thriving today! Old News Is Good News! Get The Latest Old School Boston Stories In Your Email Box. Perly Burrill Gas Station, Lynnfield, Mass. I let the gas in my car tank run down to almost nothing on purpose recently after a day trip to Salem, Mass.? Why would I do something so asinine, you ask? Well, I wanted to spend some time filling the tank at Perly Burrill iin Lynnfield. As a kid, my dad would fuel up there on the way back from visiting my grandparents in Lynn -- or after eating at the Prince Pizzeria in Saugus. You know, the place with the Leaning Tower of Pizza structure outside. Perly Burrill was unlike any other gas station on the planet. With the lowest prices, neon multi-colored lights and pennants, bright pigments saturating the little building, whirligigs, and various other doodads almost creating a cartoon-like presence, Perly Burrill lit up otherwise peaceful Salem St. at night in such a welcoming but tacky way. Why do all the fun things as a kid have to be taken away? I exited Perly Burrill with my heart broken and proceeded to a cookie cutter, "Anytown" USA gas station, and never looked back. For the record, Perly Burrill is a fuel oil supplier, and we are glad they service North Shore residents. That doesn't take away the sadness, however, of not seeing my favorite gas station in the world with its Las Vegas-like lights that made filling up on gas a fun experience. How about the amusement park rides located at the south side of the then open-air North Shore Shopping center in Peabody? The fast-moving "POW" ride scared the heck out of me! Anyone recall when the Burlington Mall was just one story? Do you remember the Methuen Mall? It's not there anymore, demolished in 1999 -- amazing, given the impressive mix of stores and overall size of this shopping area. They had a Jordan Marsh, Sears and about 70 other stores. What about the older version of Shoppers World in Framingham? This two-story, open courtyard mall was one of the first malls in the country and featured a Jordan Marsh with a dome, Kennedy's Clothing Store, a movie theater, a water fountain with colored lights and some heartwarming Christmas designs during the holiday season. I loved Shoppers World's beautifully landscaped village green look, surrounded by the 40 or so stores. Sadly today, Shoppers World looks like any other retail shopping center in our country. What memories do you have of area malls that differ greatly from the malls of today? Please comment below! Remembering Shakey's Pizza in Nashua, N.H.
With its corporate chain restaurant status, Shakey's Pizza Parlor, on the Daniel Webster Highway, in Nashua, N.H., might not have been your classic New England dining spot, but it sure was classic in the sense of fond local dining childhood memories. The dark, cavernous room with a player piano and Laurel and Hardy movies playing made the hand-tossed fresh pizza even that much better. Add some full-bodied root beer and Shakey's became one of our our favortite "cheap eats" places within radar of our Arlington, Mass., home. 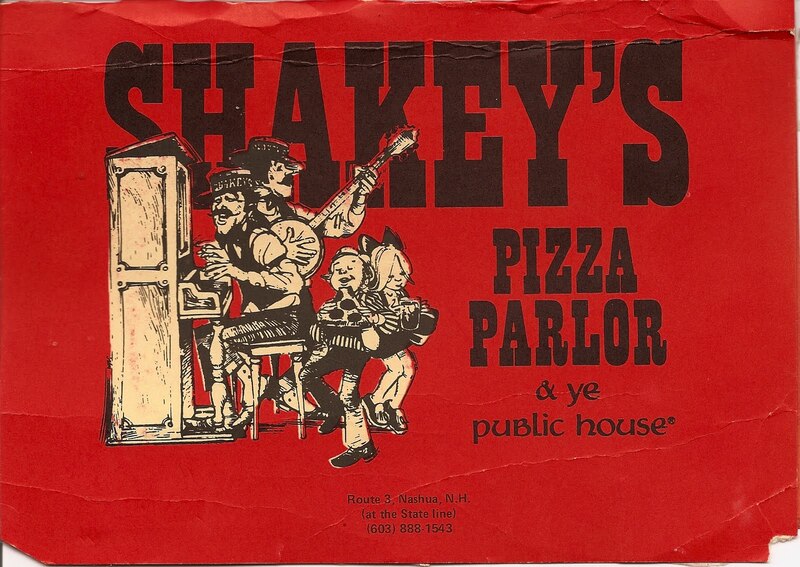 Going to Shakey's usually occurred after a day of beach fun at Silver Lake State Park in nearby Hollis, N.H.
Shakey's is long gone, a victim of Pheasant Lane Mall area development. 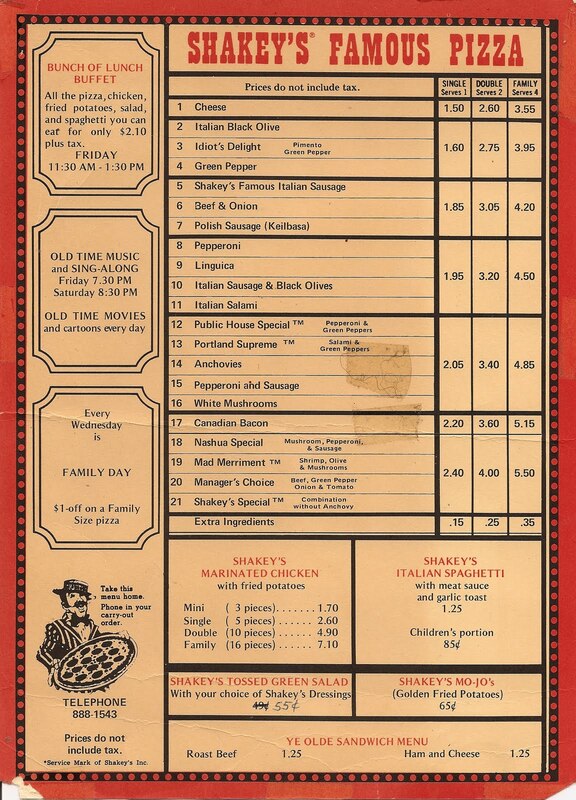 I often wonder if Shakey's would have the same favorable effect on us today. The answer is probably "yes," as you can never go wrong with good pizza, a rollicking player piano and Laurel and Hardy getting into mishap after mishap! 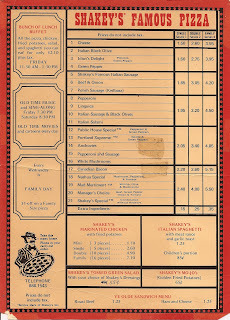 For more on Shakey's and other New England restaurants that are no longer with us, we encourage you to read our "Great memories of New England restaurants that are no longer with us" article. Dr. Mary Perry lived in a modest old gray-blue home near Lexington (MA) center in which she held her business as a pediatrician. The waiting area had toys and books all over the place and the small doctor's office -- it probably would have been a den in a residential home -- was made special by a warm and friendly doctor that totally dedicated her life to taking care of kids. If, in fact, we were too sick to make the trek from Arlington to Lexington, Dr. Perry would bring herself with little doctor's bag to our home -- even in the dead of a snowy winter -- and come upstairs to our bedroom to provide medical support. What seems like a scene from the 19th century actually happened only 43 years ago-- you know, the time of watching Gilligan's Island on television, listening to the top 40 WRKO on the radio, playing a game of street hockey in the neighborhood (translated: getting fresh air), and almost always being respectful of our parents. I know it seems like another place and time that a doctor would include a house visit as part of her practice, but quite fascinating considering this falls into a time of contemporary history, just a few generations ago. While we have some amazing doctors out there today -- and tremendous advances in the field of medicine and emergency care, to name a few -- doesn't it seem incredible and wonderful that a doctor like Dr. Mary Perry would come to one's home as part of her medical practice? That personal touch is long-gone, but the specific memory is part of the fabric that made our childhoods special -- just another memorable facet of the neighborhood feeling of our communities where people came together to help each other out. Did you have a childhood pediatrician like Mary Perry back in the day? Please feel free to share your story! Anyone Remember Chadwick's Ice Cream Parlor? What happened to Purity Supreme Supermarket? Elsie's Sandwich Shop, Cambridge, Mass. The One-of-a-Kind Willow Pond Kitchen in Concord, Mass. Looking Backward: A CHRONICLE OF BOSTON AND SURROUNDS.